Hearing has commenced on the three appeals filed by the two factions of the All Progressives Congress (APC) in Rivers state led by Ibrahim Umah and Ojukaye Amachree. 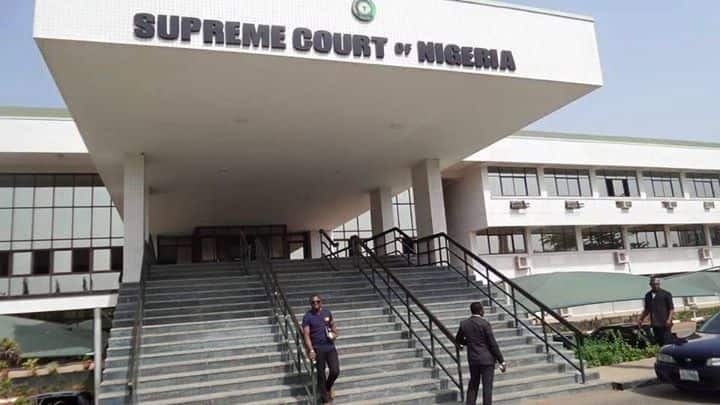 The Supreme Court in Abuja, which was commenced the hearing on Monday, February, 10, heard arguments for and against the ruling of the Court of Appeal which stayed execution of the judgment by Justice Chiwendu Nwogu, Channels reports. Legit.ng gathers that the Independent National Electoral Commission (INEC) was barred by Justice Nwogu from recognising the primaries conducted by the APC which had Tonye Cole and others as representatives of the party in the forthcoming general elections. The Supreme Court proceeded on a short recess after listening to the arguments of the parties involved. Meanwhile, Legit.ng previously reported that a factional governorship candidate of the All Progressives Congress (APC) in River state, Senator Magnus Abe, threatened that he would sue the Independent National Electoral Commission (INEC) if Tonye Dele Cole was recognised as the authentic candidate of the party for the forthcoming general elections. Senator Magnus Abe said the electoral commission might use the interpretation of the stay of execution granted the party by the Appeal Court to recognise Cole as the candidate. Speaking on a live radio programme in Port Harcourt, Abe declared that APC secured a temporary reprieve at the Appeal Court to ensure that as a party it could contest the election. He argued that the stay of execution Appeal Court granted APC is on score that it is the party that statutorily contests an election and that did not translate to mean that Tonye Cole and those produced through the direct primaries already voided by the state High Court should be fielded by the party. Abe said: "The Federal Court of Appeal grant a stay which was clearly in favour of APC. Mr Cole has his own application for a stay for himself. That order has not been granted.This is declaratory order not an executive order. "People should not stretch the interpretation beyond what it is presupposes that the court does not speak English. If the court wanted to put people's name on the list, the court would have said so, and that order would have been served on INEC."